There are many decisions to make in the moments right after your baby is born. Today's recap covers many of the important choices you have regarding the care of your new child, including breastfeeding, testing, immunizations, and more. January is almost over. Winter storms cover the East Coast. What an honor it has been to serve you wherever motherhood finds you this winter. Are you familiar with our tagline? "Nurturing the mother to grow the child." Do you know how deeply we believe this? Motherhood is challenging. Our primary goal is to nurture, support and educate you; enabling you to make the choices best for your family. We are passionate about cheering you on - helping you find your truth. My heart was filled to overflowing as I watched so many of you play with different baby carriers at the Saturday Café Express and Monday Café. Your laughter and encouragement was contagious. For those of you who joined us for the first time, I applaud you for your bravery in stepping out to connect with women you did not know. For those of you who missed your time with us, be sure to visit the blog for recaps and valuable information. Be sure to check out all of the upcoming events listed on the calendar. There are many opportunities for connection and support wherever you have need. If there is any way in which we could be serving you better, please let me know. Kayla was originally brought on as our Treasurer due to her fantastic skills with numbers, but has transitioned into the many roles above as her dreams for our organization have grown. The mother of two, Kayla visited our Café after the difficult birth of her first son and found much more than she expected. She likes to tell of the healing she found and the relationships she developed with mothers of the Collective© - both of which helped transform her second pregnancy and birth. Passionate about our mission and focused on serving women through education and support, Kayla works daily to sharpen our focus, develop new programs and increase awareness in the community as a Managing Director. Kayla has two exciting projects debuting in the New Year; the Info Booth and Bump Clubs. The Info Booth will serve to further connect women attending our outreach programs to the greater efforts of The Motherhood Collective©. The Bump Clubs (official name TBA) are still in development, but are the solution to the pleas we have heard from you, our mamas, to deepen relationships with mothers walking through the same milestones of motherhood. We are so excited for our upcoming 2014 Workshops and Kayla is, yet again, the force behind these wonderful evening events! Come January, on Café mornings you will find Kayla behind the Info Booth in the first hour, then actively participating in the Pregnancy Small Group during the second hour. She looks forward to connecting you to this collective group of mothers! Thank you, Kayla, for serving the women and families of The Motherhood Collective©. PS – Interested in helping serve as a volunteer on one of Kayla’s projects? Fill out a volunteer form here and tell us so! Ever wonder who’s behind The Motherhood Collective? Over the next few weeks we’ll be introducing you to our dedicated team of volunteers. These women are all mothers – once, twice or many times over. While they come from different backgrounds and have various approaches to pregnancy, birth and parenting, each one is dedicated to creating a place where ALL mothers can find education and support. We’re so excited to introduce you to Miss Debbie! She is our Lead Childcare Worker and spends her Café Monday mornings lovingly caring for the children of our local mamas. Miss Debbie has transformed the Childcare we offer on Monday mornings at the Café. As a mother to many, her years of experience as a mama and grandma probably have something to do with this. Greeting the little ones, ages 1 – 4, with a warm smile and big hugs she works with her two assistants (Miss Amanda and Miss Abby) to bring fun and order to the two hours she spends with the children. By limiting the childcare number to 15, Miss Debbie and her assistants are able to provide careful attention to allergies, special needs and requests. In addition, Miss Debbie creates an environment that is warm and welcoming for many of our little ones who are experiencing their first childcare situation. Children spend the morning in a room directly adjacent to our Café meeting space. During check-in, mamas fill in detailed name tags, complete with allergy information, age and nickname. The children are then welcomed into a room with a soaring ceiling and lots of light, and filled with age appropriate toys, books and activities. Our Cafés meet the second and fourth Mondays of each month. 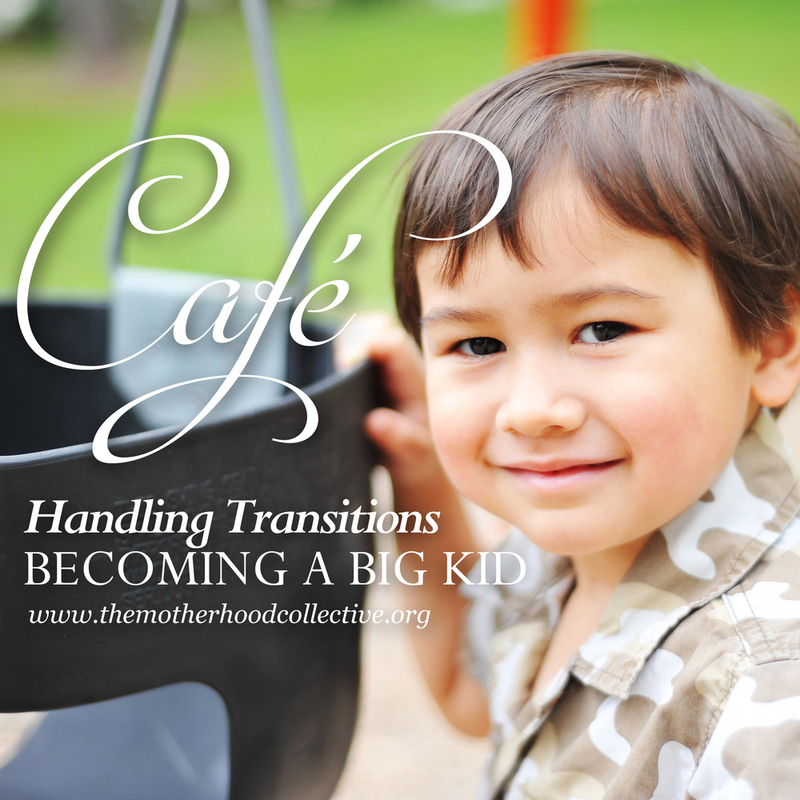 Registration for our Café Childcare opens at noon on the Monday before a scheduled Café. Registration is available on a "first-come, first-served" basis and closes after reaching 15 spots or at 7pm the Sunday before the Café (whichever comes first). If you are local and have utilized our childcare, we hope you will take the time to thank Miss Debbie for her excellent care of your children. She has filled a very specific need most beautifully. Thank you, Miss Debbie, for serving the women and families of The Motherhood Collective©. Click here for additional details regarding our Café Childcare can be found here. Ever wonder who’s behind The Motherhood Collective? Over the next few weeks we’ll be introducing you to our dedicated team of volunteers. These women are all mothers – once, twice or many times over. While they come from different backgrounds and have various approaches to pregnancy, birth and parenting, each one is dedicated to creating a place where ALL mothers can find education and support. Meet, Maria, one of our Managing Directors, who might best be described as the "Swiss Army Knife" of The Motherhood Collective©. Without Maria we’d be all over the place. She has many job responsibilities, and somehow, they all seem to involve keeping us in line. Her main focus as one of our two Managing Directors is serving as our Non-profit Consultant in everyday, behind the scenes “business” work. Running an organization such as ours is not all hugs and coffee, and we are very thankful for the hours Maria spends on the not-so-thrilling tasks that make our time with you more enjoyable. Maria also handles the placement of our volunteers as our Volunteer Coordinator. We are extremely fortunate to have women rise up continually to serve with us. These volunteers help on both large and small levels and they come to us with differing skill sets and available time. Maria works with these women to find ways they can best contribute and give back. On Café mornings you might never see Maria, because once again she is holding us together - this time as our Café Morning Stage Manager. She assigns morning tasks to the leadership team, checks us in on arrival, runs the soundboard and gathers donation dollars... all so we can serve you better. Maria wandered into a Café one morning; pregnant and unsuspecting of the role she would one day play. Now the mother of a beautiful toddler, she shares her joys, struggles, and lessons learned in an honest and refreshing way. With big dreams for the year ahead, Maria brings us years of management experience, a "peppery" frankness and a dry sense of humor that will make anyone smile. Thank you, Maria, for serving the women and families of The Motherhood Collective©. PS - Interested in volunteering with The Motherhood Collective©? Contact Maria at: volunteer@themotherhoodcollective.org. Ever wonder who's behind The Motherhood Collective? Over the next few weeks we'll be introducing you to our dedicated team of volunteers. These women are all mothers - once, twice or many times over. While they come from different backgrounds and have various approaches to pregnancy, birth and parenting, each one is dedicated to creating a place where ALL mothers can find education and support. Meet, our fabulous Liz! She's our Webmaster, Photographer and Designer! Ok to start, this site that you're on right now, would not exist if not for Liz. From the stripes, color and font you see to all the behind the scenes "code", Liz did it all. We are so grateful to her for making our web presence so beautiful, welcoming and FUNCTIONING. Liz joined us, as many have, by simply attending our Café outreach as a first-time mother. But it didn't take long at all for her to go from receiving to giving back. Honestly, one of the best ways to describe Liz is "immensely giving". By trade, our Liz is a photographer. It is her photos that you see beautifully capturing the love between mother and child on every piece of Motherhood Collective promotional material. We benefit from her gifts again and again with each new project. When she's not keeping this website afloat, designing new products (like our t-shirts she's wearing in the photo above!) or photographing our mamas, she can be found behind the sound-booth on Café Mondays. Keeping our panelists audible can be quite the challenge over our vocal audience of chatty babies. With dedication, enthusiasm, a constant fresh outlook and an infectious laugh, Liz has a passion to keep us, "nurturing the mother to grow the child". Thank you, Liz, for serving the women and families of The Motherhood Collective©.